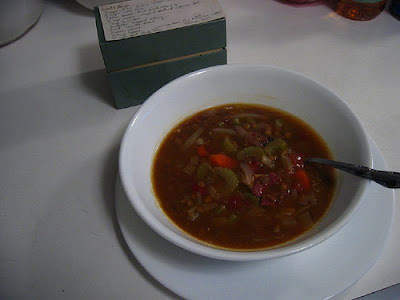 I’m not the first food blogger to post a lentil soup recipe, obviously. But I take a lot of pride in the fact that my recipe is quite possibly the easiest one you’ll find. 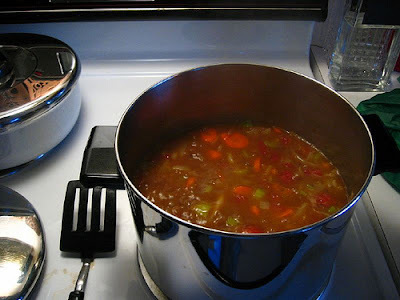 The prep work takes 15 minutes at most, and then you just need to give the pot an occasional stir while it’s simmering. This soup is equally good in either vegetarian form (leave out the ham/bacon and bouillion) or carnivore-form. Bring water, lentils, whole cloves and bay leaves to a boil, cover, reduce heat and simmer for 1 hour. Then, add all other ingredients (except cider vinegar), and simmer for 45 minutes to 1 hour, stirring occasionally. Finally, add the cider vinegar, stir, and serve. 1) This is another one of those recipes that takes laughably cheap to a new level. If you make this soup in vegetarian form, the entire pot of soup costs about $4.75. That works out to about 60c per serving. And people think it costs too much to cook a meal at home. 2) A funny thing about this soup (and many other soup recipes) is that they taste noticeably better the next day. Sometimes a soup needs a day for the ingredients to blend and settle in. That’s why soups like this can be ideal for company--you can get all the work out of the way a day in advance, and when the company comes all you have to do is spend a few minutes reheating the pot. 3) Regarding energy density: despite the fact that this soup is surprisingly filling and hearty-tasting, it is not energy dense. In other words, this is an ideal meal if you’re on a diet or trying to lose weight, but it’s less than ideal if you’re fueling up for feats of endurance. Don't expect a big bowl of this soup to sustain you for tomorrow’s 10-mile run. I've recently discovered a love of lentils, and this looks delicious. (I'd probably serve it over brown rice to make it more "energy dense" and sustaining.) Putting it on the list to make next week. I'm intrigued to see how the cloves blend into the flavor. My dad once brought home a couple of big marrowbones, "for the dogs". Given that we had miniature dachshunds, the bones were bigger than they were. My mum grabbed the bones first, and boiled them into a rich beef broth. After that, my folks would get free "dog bones" each week, and once a week, we'd have great soup - homemade broth with plenty of veggies and barley in it. This soup falls into the same category - laughably cheap and ridiculously easy, and with a loaf of good bread, a soul-sustaining meal. I will definitely make it, but probably use some of those "dog bones" to make the broth instead of using bouillion cubes.